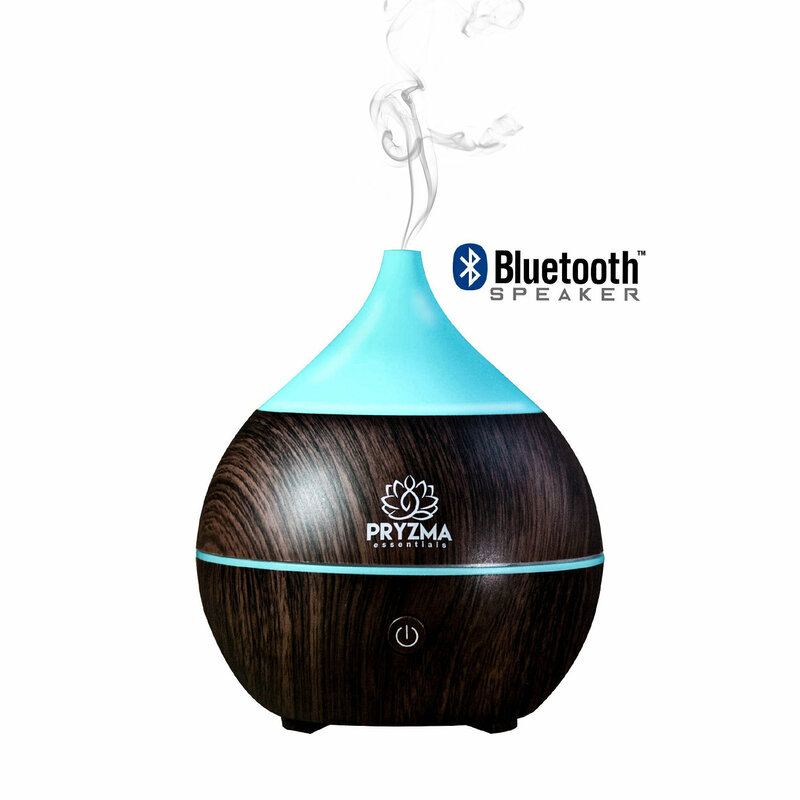 PRYZMA ESSENTIALS ULTRASONIC BLUETOOTH SPEAKER DIFFUSER HUMIDIFIER combines aromatherapy diffuser, LED light/nightlight and music player in one device. Pryzma Essentials can hold up to 200ml of water and produce up to 30ml of moisture per hour. It can run up to 7 hours of continuous output. Through air diffusion, a few drops of essential oil can deliver therapeutic aromatherapy throughout your room while clearing the air and creating a pleasantly fragrant environment. 7 COLOR CHANGING LED LIGHT. The LED light can be set to one or a series of seven colors, also works as an ideal nightlight and ambient light creating a calm and romantic environment. Absorbing energy from the full spectrum of colored lights stimulates the body’s circulatory system, immune system, endocrine system and nervous system. ULTRASONIC MIST. Mist using essential oils brings clarity, tranquility and stress relief, as it re-lives dry sinuses. Pryzma Essentials Humidifier Speaker Shuts Off Automatically When the Water Runs Out. Portable for Home, Yoga, Office, Spa, Bedroom, Babies and Children's Room. Perfect gift idea for family and friends who love aromatherapy or can benefit from Aromatherapy healing.